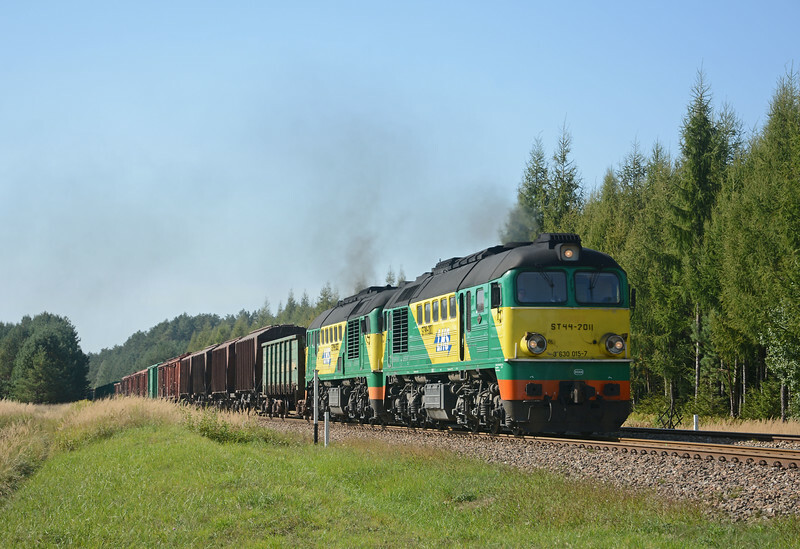 The Linia Hutnicza Szerokotorowa (LHS) – literally Broad Gauge Metallurgical Railway – is a division of Poland’s state railways (PKP) linking the Polish/Ukrainian border at Hrubieszow with Silesia, a distance of almost 400kms. It is the longest broad gauge (5’ – 1520mm) railway line in the European Union (with the exception of Finland of course, which is 5' throughout). Built in the 1970s by Poland’s then Communist Government, its prime purpose was to transport iron ore from Ukraine direct to the steelworks of Silesia without transhipment. Today, with the steel industry in Silesia being much reduced, the railway also carries general merchandise, containers, grain, timber and oil and petroleum products as well as iron ore. Unlike Slovakia’s similar, but shorter, railway between Ukraine and the US Steel steelworks at Kosice, the LHS is not electrified. Motive power consists of three diesels types, all based on Russian designs from the Soviet era. The most characterful are the ST44s, a version of the USSR’s universal export locomotive of the 1960s, the M62. Built by the Voroshilovgrad Locomotive Factory in Lugansk in Eastern Ukraine and powered by a Kolomna 14D40 2 stroke engine, 3000+ were built over a period of almost 30 years. They are noisy, dirty, cumbersome machines which still earn their corn on the LHS after over 40 years of service. More modern are two local rebuilds of Soviet era locomotives. The most impressive are the ST40s, a rebuild by Polish builder Newag of surplus M62s, which involved a complete redesign above the frame. The result – nicknamed Robocop on account of the cab design – is an impressive looking locomotive, rather like a class 58 or class 70 with a narrow car body and a cab at each end. The Kolomna engine has been replaced by a North American GE 7FDL. The bogies remain from the M62 but now carry GE traction motors. The third type is a rebuild of the ubiquitous shunting locomotive of Eastern Europe, the TEM2, which in Poland was known as an SM48. Based on an Alco design (Alco supplied locomotives to the USSR during and immediately after the war) over 10,000 TEM2 were built by locomotive works at Bryansk and Lugansk from the early 1960s onwards. For the LHS Newag has rebuilt the TEM2 into the 16D, a modern looking shunting and road locomotive with a cab at one end a low hood to provide good visibility. Another US sourced power plant is used, this time a Caterpillar 3512 C.
Although the line is almost 400kms long I concentrated my weekend on the 150km stretch from the River Bug, the border between Poland and Ukraine, to the crossing of the River San near Nisko. Over this stretch the railway is (roughly) paralleled by highways 74 and 858 through the towns of Zamosc, Zwierzyniec and Biłgoraj, sometimes quite close but on other occasions requiring diving down minor roads and getting lost, so a decent map is definitely required. Unfortunately between Biłgoraj and Nisko the local road authorities are doing work at a number of locations which requires detours which makes chasing trains rather problematic. The crossing of the River San is on an impressive five span girder bridge with a long descending grade facing westbounds on the approach to the bridge. Some undergrowth clearance on the embankment on the eastern side would open up a decent shot with a telephoto lens of eastbound trains. The bridge incorporates a walkway across it on both sides which I guess are for railway staff on maintenance duties, but I did notice an elderly local wheel his bicycle up to track level and then cycle across! For most of the route from Hrubieszow to NIsko the LHS runs parallel with a standard gauge line, on first inspection it appears to be a double track railway, but isn’t! From Hrubieszow to Zamosc the standard gauge line is freight only, whilst west of Zamosc there is a limited passenger service. The LHS is freight only throughout. Traffic on the LHS is exceedingly variable, with long waits between trains although thanks to the relatively slow speed of most trains, they are long and heavy, it is possible to get multiple photographs at different locations. On Friday between about 09:30 and 18:00 I saw six eastbounds but only a single westbound. Trains lengths varied from a relatively short PW train to trains of 50+ wagons hauled by pairs of ST44s and in one case two ST44s and a 16D.